High value for such a premium brand, this is a serious electro 12-string that focuses on sound and playability. Decent value for money, but build quality is still very high. Expansive tones. Hard to pick holes at this price. 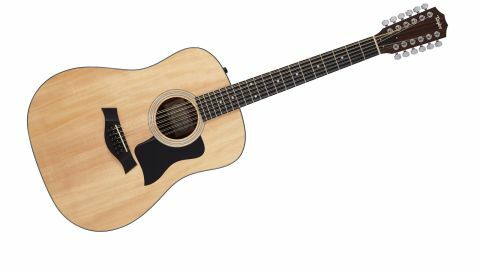 The 100 series is the entry point to full-size Taylor instruments, and like the firm's popular 200 series, all guitars are Mexican-made with a choice of just dreadnought and grand auditorium body sizes. It's a trim range of four models, that was augmented at this year's Frankfurt Musikmesse with a fifth: a 12-string non-cutaway dreadnought that is unique - all Taylor's other 12-strings use the grand symphony body shape. Devoid of any deluxe status, the 150e looks a little blue-collar, but with a return to traditionalism for many current bands and players that's maybe no bad thing. Nor is the price: half that of the 356ce. "There's a very expansive voice to this guitar, the upper jangle suiting the dreadnought's fuller, 'dirtier' low end"
The 150e's elongated headstock changes the balance point from your usual acoustic and the bigger neck is initially quite a handful with a wider nut, although in terms of depth - 21.3mm at the 1st fret, 22.5mm at the 10th - it is identical to the six-string. There's a very expansive voice to this guitar, the upper jangle suiting the dreadnought's fuller, 'dirtier' low end. This is quite a rootsy-sounding instrument: less piano-like than the grand symphony 12-strings? It certainly sounds it. The treble EQ on the 214 can add modern zing or, when reduced, a darker, more magnetic soundhole-pickup type of sound. It's the same deal with the 150e, which suits that slightly magnetic tonality of the Expression System as you move up the fingerboard. Likewise, the more blue-collar 150e. It certainly isn't the most affordable 12-string electro on the market, or the prettiest, but with its faultless build quality, stellar playability and intonation, and excellent sound - not to mention a sturdy 'hard' gigbag - it's almost a no-brainer for the pro-minded gigging and recording musician.